With so much phenomenal music being cultivated in the early 1990s, including but not limited to: UK-based "dreampop," the raw, bottom-heavy demi-metal coming from the Pacific Northwest (aka grunge, duh), not to mention industrial, power-pop, and plenty of good ol' American indie rock, I suppose it's understandable why New York City's Springouse were sort of lost in the fray. Indeed, "alternative rock" was about to bum-rush the mainstream, but virtually anything not airing on MTV fared no better then before...despite the "revolution." A trio (not quite the "power" variation), spearheaded by singer/ax-wielder Mitch Friedland, Springhouse boasted something most new bands couldn't - something of a built-in audience, thanks to drummer/backing vocalist Jack Rabid, an established music journalist and publisher of Big Takeover magazine. Springhouse would eventually ink a two-album deal for Caroline Records, but not before issuing a two song 45 on Bob Mould's short lived Singles Only Label. Friedland and Co. sculpted a wonderfully melodious shade of modern Anglophile rock, with a propensity for deliriously chiming guitar-work, gracing the backdrop of an unmistakable melancholic ethos. 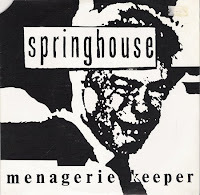 The A-side to this single, "Menagerie Keeper" by and large fleshed out the blueprint that would be Springhouse's calling card on their remarkably consistent, but otherwise under-promoted albums, Land Falls (1991) and Postcards From the Arctic (1993). Largely obscured from Springhouse's pensive, world-weariness, lurked a cautiously optimistic outlook, faint as it may have been. Fans of the Chameleons UK, Echo and the Bunnymen, and the like will find a treasure trove of fine music on these records. Springhouse have reconvened for a new album, From Now to OK, set for release later this year on Independent Project Records, as well as a brief fall tour. Music can be sampled and tour dates can be obtained from the band's Myspace page. Hey This is Mitch of Springhouse..just letting you know how we created Menagerie Keeper. I wrote the song's intro during soundcheck at a House of Love show we did at the Marquee. We had most of the material written for Landfall, so Bob Mould asked us for a new song and alas we went into Water Music Studios in Hoboken with Mike McMackin and whipped up this song in 2 days. For those not in the know the picture sleeve is of Jim Baker. the song that you have included as the bside "Soul Astray" is not the song "Soul Astray" nor is it even by Springhouse. I know this because I was told so by Mr Jack Rabid himself...after I downloaded this song and posted a video to youtube of both songs for people to enjoy. Just wanted to let you know so that the band is not misrepresented...or so that the actual band who is responsible for the song is not credited. Who is the other band? Still a cool tune. ITS JUST NOT BY SPRINGHOUSE. it still makes me happy whenever i come to this page and read the super kind words. our band meant a lot to us, and it is so INCREDIBLY gratifying, just plain lovely, like spring rain, whenever we find that despite our lack of mass awareness, we haven't been forgotten at all 2 decades later. to anyone who is still playing one of our records, for any reason, i say nothing but you have my heartfelt thanks, as we created them hoping they would last like OUR favorite records. Just bought one of the few copies of this album I could find - I remember it fondly! "Alone" has been occasionally popping into my head since, like 1993, which may be the last time I heard it! Any way you could re-up it. ?